I have never seen it mentioned here, so I thought I'd ask. I was just wondering if anyone here is a member of the BMW MOA? I got a free one-year, full membership card, when I purchased my XR. I checked out the MOA forums and I don't think they are any more informative than here. In fact, I like the look and feel of this forum better. I do get the monthly magazine and the other perks with my MOA membership. I guess if you are stranded in the middle of nowhere, the BMW owner's directory really comes in handy. I've seen stories of BMW owners in the directory coming out, trailering the disabled bike and bringing people back to their house, while providing food and lodging for them. That's a pretty cool benefit to have if you tour a lot and may get into that situation away from home. I was just wondering about peoples thoughts on the MOA and if you are a member or not. I've been a member for 8 years. I've been to one rally and it was really fun. 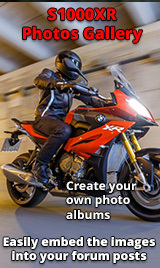 Don't use the motorcycle-specific forum that much except for travel planning. Their superstakes is really a good deal and charitable fundraising is pretty well managed. It's probaby a good option if you don't have a local owners group. Thanks for the info Toolman. Thank you all for the comments. I appreciate hearing them.